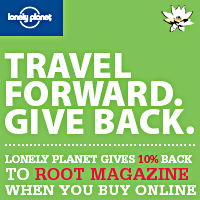 Support Root Magazine Save 30% on Lonely Planet! Purchase any Lonely Planet guide and receive 30% off your entire order. 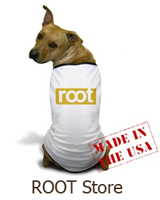 Plus, an additional 10% of the retail price of your total purchase will go directly toward supporting Root Magazine. To redeem offer, enter promo code: ROOTMAG on the checkout page. This offer is valid until August 1, 2008 at 11:59pm United States PST. This offer may not be used in combination with any other special offer or promotion and excludes theme packs and digital guides, and discount does not apply to shipping cost. Order must meet the conditions outlined above in order to qualify for the special offer. Promotional code must be entered for offer to be valid. Code is case sensitive.